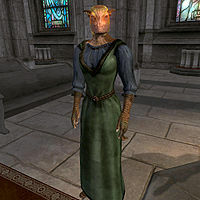 Marz is an Argonian healer who offers advanced training in Restoration at the Great Chapel of Mara in Bravil. She will always be killed during the Knights of the Nine quest Nature's Fury. Note that her replacement, Beem-Kiurz, will not provide you with the necessary reference to begin the Restoration Training quest. She can be found sleeping in the Chapel Hall every night between 12am and 6am, and once she wakes up she will take a relaxing stroll around the downstairs area, either by visiting the Undercroft, the Hall or standing on the staircase leading up to the main Chapel. After two hours, at 8am, she will begin her duties with a two-hour prayer in front of the Altar of the Nine, followed by an additional two hours of silent praying on a pew. At midday Marz will return to her wandering routine around the Chapel. At 4pm she stops strolling and receives several blessings from the altar of Mara for one hour. Once she has gotten her blessings of the day, she will find an available pew where she can sit and pray for three hours. As the night approaches, she will enter the Chapel Hall at 8pm for a two-hour dinner, followed by one last walk around the Chapel until she finally decides to go to bed at 12am. Her services will be available at any time of the day, except when she is praying in front of the Altar of the Nine, when she receives a blessing from Mara, or when she eats or sleeps. Marz's outfit is a typical middle-class affair, consisting of a blue & green outfit and a pair of quilted shoes. In her inventory she carries the Chapel key, as well as a medium amount of gold. Marz knows a leveled set of healer spells, as well as one extra major Restoration spell. When introducing herself for the first time, she will provide you information about her services and her role in the Chapel as well: "I am the healer, Marz of Black Marsh. By the grace of Mara, I am available as an Advanced Trainer in Restoration." However, if you inquire about the city of Bravil, she will reveal that she actually misses her homeland: "I came to Bravil because Mara called me. Bravil is not my home, I miss Black Marsh. But I shall serve here, so long as Mara needs me." As an advanced trainer in Restoration, Marz can provide you the reference for the master trainer once you have achieved the necessary skill level: "Oleta was the most gifted healer I've ever known. If anyone can teach you more, she can. She worked in the Chapel of Akatosh in Kvatch. I haven't seen her in quite some time." The townsfolk of Bravil seem to be very satisfied with Marz and her healing ability: "I'm glad Marz lives in Bravil, she's an excellent healer." and "Were I injured, I'd seek out Marz." Some citizens, however, have heard about her being homesick: "Marz is an excellent healer, but I understand she longs to return to the swamps of Black Marsh. ", "Marz is an excellent healer, but doesn't she seem sad to be here? ", "Have you ever talked to Marz at the chapel? She seems sad to me. ", "I understand Marz wants to return to Black Marsh. She only stays because she feels needed here. ", "I've been told that she really wants to return to Argonia, but her services are so useful here, she feels compelled to stay." and "Marz is a gifted healer, and teacher. I know that she longs to return to the swamps, though." Once you have installed the Knights of the Nine official plug-in, Marz will be killed in an attack on Bravil's chapel that occurs at the completion of the Nature's Fury quest. At that point, only Ohtesse will be available to provide advanced Restoration training, and she is also fated to die soon after. Once the Knights of the Nine questline is completed, Marz is replaced by Beem-Kiurz who is basically identical to Marz, other than being male instead of female and other than not providing the Restoration Master Training reference (see Beem-Kiurz' page for details).